Several institutions in Slovenia are active in the above mentioned research. The traditional research in nuclear magnetism (NMR, NQR, EPR) in Ljubjana was complemented by a home built SQUID magnetometer about 10 years ago. Its measuring capacity soon appeared to be too small and we purchased a new Magnetic Properties Measuring System MPMS-XL-5 (Quantum Design, San Diego, USA) in 2003 with improved sensitivity and user friendly automated measuring software. It contains facilities for the dc and ac magnetization measurements as a function of temperature and applied magnetic field; zero field and sample rotation option is available. This way a high quality magnetic measuring system is added and we can easily cover the growing magnetic research needs. In order to achieve better efficiency of this powerful equipment we established an association of several research institutions, called the Center for Magnetic measurements - CMag. 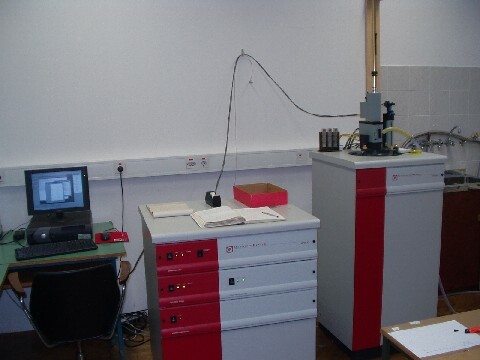 In 2009 the laboratory's research equipment was upgraded with a new Physical Property Measurement System from Quantum Design. The PPMS with 9 T magnet offers: resistivity and ac-transport measurements, heat capacity and thermal transport measurements from 400 K down to 300 mK with 3He Option. In addition, we extend the MPMS options with the home made module for measurements of dielectric constant in magnetic field.